The Middle Child took part in the Kool Skools project a few months back, and we were chuffed to hear his band do their thing on a professionally recorded CD. These kids have talent.... and that's not just parental pride talking. 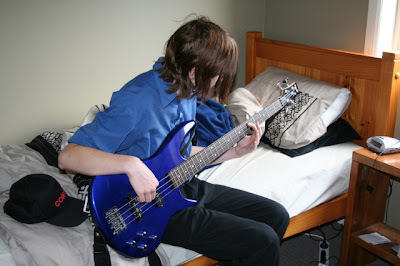 Seems it was worth putting up with the frequent doompa-doompa emanating from his room, because he plays a pretty mean bass. 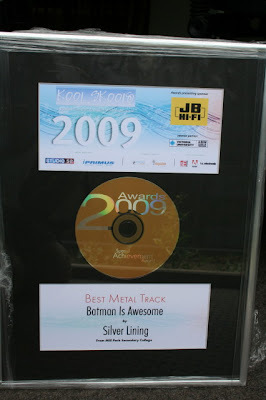 Last night Kool Skools held their 2009 awards presentation, and his band was one selected to perform. Because we're bad parents we didn't get much notice and had other things to do, we didn't go. The function is supposed to be broadcast on some obscure TV station anyway, so we figured we could record it and watch edited highlights. He wouldn't let me take a photo of him with the award, because: "Mum! I'm in my stupid work clothes! ", but I snuck one of him in his room anyway. There is a face hiding behind that hair somewhere. This is totally crap quality video (I filmed it from up the back of the school gym, over the heads of a hundred or so Year Nine kids) and the sound is pretty ordinary, but I'm going to inflict it on you anyway, at least if you're game to click on the play button. Oooo yeah. This makes me want to smoke some weed and be 18 again. er.. probably not what you wanted to hear..? I mean.. they is really good! But, for god's sake don't tell him I said that, because I'm really old and uncool. Those boys are great. You have good reason to be proud. I said THEY'RE REALLY GOOD....DID YA HEAR ME?? Deb! WASH YOUR MOUTH OUT!! I left a comment last week but it didn't go through - congrats - awesome effort!